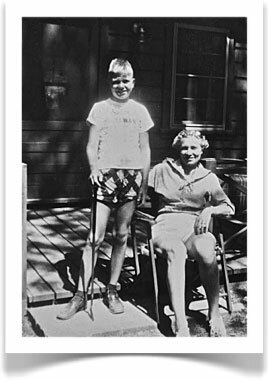 When La Canada resident, Hank Klein, refers to his childhood as a dark time, he is referring to when he was separated from his mother at an early age. Hank grew up in a children’s home while his mother worked day and night to make ends meet. When his mother’s situation improved, she returned for him. Unfortunately, shortly after Hank and his mother were reunited, she learned that she had breast cancer. She died shortly after the diagnosis. The one memory Hank retains about his mother is watching her paint. Her paintings seemed idilic to him, flowers lining a garden path, a cottage in the woods. Recently a relative gave Hank several paintings by his mother. “Though tarnished with age,” Hank said, “one painting stood out to me, a garden path with flowers leading up to a cottage.” Through a recommendation Hank brought the painting to Whites Art, Framing & Restoration Gallery in Montrose. There he met Miguel Perez, proprietor and a fine art restorer. 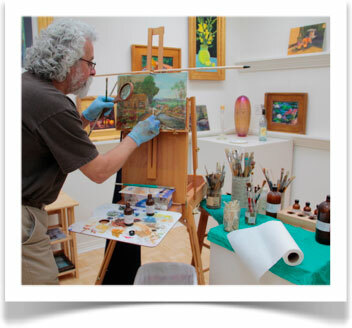 Miguel has been restoring fine art for almost 40 years. He works beneath a bright light and magnifying glass. He works slowly and methodically, with solvents and neutralizers, cotton balls and Q-tips, sometimes losing track of time. Eventually the painting that the artist intended emerges from the many layers of grime, smoke, dirt and old varnish. Miguel never seems to tire of seeing the beauty of the original painting materialize. He especially enjoys working on paintings that have sentimental value to his customers, like Hank Klein’s. Besides restoring family heirlooms, Whites Art, Framing & Restoration Gallery features exhibitions spotlighting the creative works of local and international artists as well as fine art framing for artists, dealers and private collectors. Call or email Miguel for press or media coverage: (818) 957-4071, contact@whitesfineart.com.